The usual stereotype of students is that we spend all of our money on nights out and takeaway pizza. For me, most of my money is spent on late night ASOS hauls and travelling. 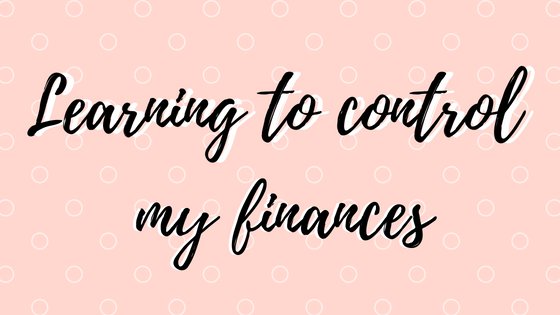 Let's talk about how I'm learning to control my finances. Growing up, I never had a great deal of money and so, when I moved to University and started my internship, the amount of money going into my bank account could be quite overwhelming at times and I didn't really know how to deal with it. I knew that I had to make this money last but I often get stressed and anxious. What do I do when I get stressed and anxious? I shop. I buy things I don't need. I feel guilty and worry about how much money I have to get me through the term. So, I buy more. It's a vicious cycle and I'm learning to break out of it but not surprisingly, it's a difficult thing to do. There really should be more education in schools about how to manage your finances because at the age of 19, I still don't really have a clue about taxes etc and it really does confuse me but hey, let's just keep teaching kids the cells in a plant and algebra, because that will realllly help them in life. Sigh. I'm quite an organised person and anyone who knows me will know that I have a spreadsheet for pretty much everything in my life; Blogging? Packing lists? Reminders? There's spreadsheets for them all. So, it makes perfect sense to create a spreadsheet for my finances. That's what I did and it's confusing. I would recommend making a spreadsheet to see your finances all in one place and have details of when money is going in and coming out of your bank account but from my experience, I wouldn't exclusively use this as a way to track your finances. Purely because, some weeks you're going to spend more than others and so, sometimes a weekly budget just isn't going to work. Don't use contactless. This is one of the best things I've done to stop spending money on pointless things. It's true what they say, when you use contactless, it doesn't feel like you're actually spending money. Until you check your bank account and realise you have way less money than you expected. I like to check my finances regularly and so, using contactless makes that difficult because it takes a while for the transactions to actually show in your account and it just all gets a bit confusing. Also, I don't know if it's just me being incredibly lazy but sometimes, I just can't be bothered to pay using pin and wait around for it all to go through so this just prevents me from buying things I don't need. I am lazy but if it stops me from spending money, that's all that matters. Set an amount that you want to spend at the beginning of the week and draw the cash out. Like I said, it's hard to maintain a constant weekly budget but making a plan of what you want to do each week and how much you want to spend and then drawing the cash out really helps to make sure that you don't overspend. Sometimes, I leave my card at home and only take cash so I can't buy that new bag because let's be real, I don't need any more bags. What I've realised lately is that I always spend more when I'm bored. So, I'm trying to keep myself distracted; writing new blog posts, finding new things to watch and working on my overall brand in general are just some of the things that I've been doing this Summer when I'm at home and wanting to make an unnecessary purchase. This has definitely helped me and I think that this will be even better when I move back to University because I'll be spending most of my time doing uni work and work for my internship so, I'll have less time to sit around wondering what on earth to do. Lately, I've become very much aware that I buy things when I'm feeling bad because I think that it'll make me happy. Guess what? It doesn't. Sure, there's that little "oooh I just bought something nice" buzz for a couple of minutes after the purchase but that's not going to make my problems go away. Actually, it might make my problems worse. That's why I'm learning to control my finances. What are your tips for controlling your finances? Let me know! I have a seperate account which I use to buy things with, and my salary and etc goes into my other account. SO, I have to transfer to my buying account when I need to buy anything, which limits me.